Color Forecasting Event in Milan a HUGE SUCCESS! GLOBAL INFLUENCES DIRECT FUTURE COLORS. Every year over 400,000 design lovers come to the city of Milan to indulge in the latest collections and ideas from world-wide designers. 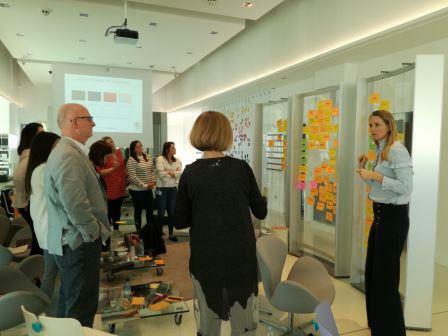 For three years, Clariant Colorworks EMEA has hosted Color Marketing Group’s Milan ChromaZone®, a color forecasting workshop, on the Monday before the Milan Design Week begins, enabling its participants a first dive into the stories and colors for the next two years to come. This ChromaZone in particular attracts an international group of color experts, flying into Milan from Australia, New Zealand, Canada, United States, Germany, Serbia, and many more places. This is a unique group ranging from vice president’s of design, design managers, and design directors of laminate and flooring companies to freelance textile designers and color experts from paint and pigment producers. They gather each year to talk about the global influences on their products, their consumers, and how these will direct future color choices in their markets. This year a group of 16 color experts had one common thread – the influence of yellow on the overall color directions moving to 2020+. Neutrals were moving away from being true greys and were tinted with warmer, yellow tones. The group felt it was surprising that even though we all came from different markets, different regions, and yes also cultures, we came with very similar colors. All participants discussed the importance of yellow, and the continuing popularity of terracotta-tinted orange. That however, is all I am going to give away with regards to the final color selections from this fabulous ChromaZone®! 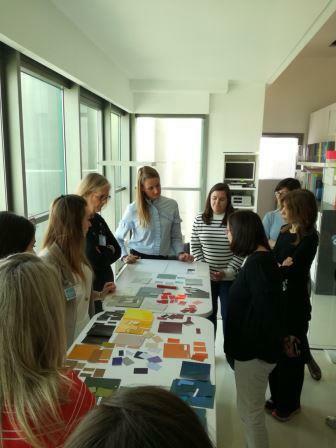 For the third year in a row, this color forecasting workshop in Milan was a great success, mixing a group of long-standing CMG members and newbies, discussing what the future will bring for us who live in color. Now what can be better than that? Miss the Milan ChromaZone®? Check our calendar of events for this year to see if there’s a Color Forecasting Workshop near you. Is there a way to attend without physically being there on this out of the country events. Still pay a fee but video/audio in?